0% non-fat yogurt. Naturally powering Team USA. Proud sponsor. Only natural ingredients. Excellent source of protein. Made with real fruit. Milk from cows not treated with rBST (According to the FDA, no significant difference has been found between milk derived from rBST-treated and non-rBST treated cows). We give 10% of our profits to charity. Probiotics. Live & active cultures (Meets National Yogurt Association criteria for live & active culture yogurt). Certified gluten free. 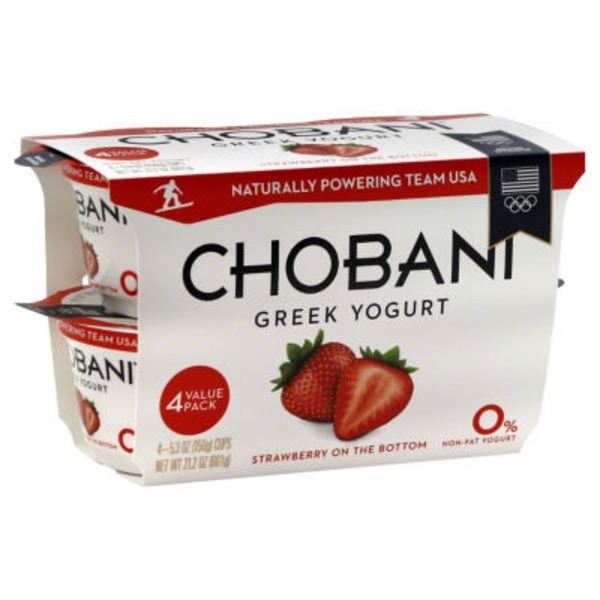 Grade A.
Lowfat Yogurt (Cultured Pasteurized Nonfat Milk), Evaporated Cane Sugar, Strawberries, Water, Fruit Pectin, Natural Flavors, Locust Bean Gum, Fruit and Vegetable Juice Concentrate (for Color), Lemon Juice Concentrate. Contains Live and Active Cultures: S. Thermophilus, L. Bulgaricus, L. Acidophilus, Bifidus and L. Casei.